Following his freshman year at Southwest Texas State Teachers College (now Texas State University-San Marcos), Lyndon Johnson accepted a teaching position in a small South Texas town at a school for Mexican American grade-school children. 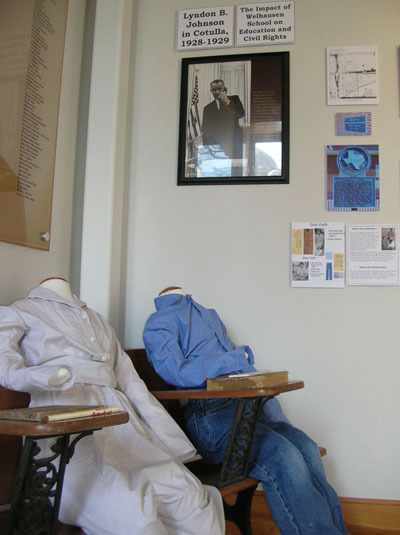 Our new rotating exhibit, Lyndon B. Johnson in Cotulla, 1928-1929: The Impact of Welhausen School on Education and Civil Rights, sheds light on the early experiences of our 36th President and the landmark legislation passed during his administration in the 1960s. The centerpiece of the exhibit is an unusual two-seated school desk (donated by Dr. Gwen Smith) from the 1920s-30s and a pair of historic costume reproductions by Camee Waterson which she based on photographs in our museum. 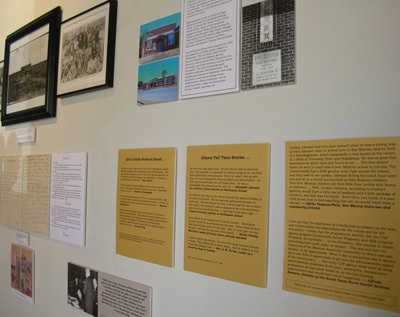 Historic and contemporary photographs, oral history excerpts from his former students and Cotulla residents, a cartoon, Johnson quotes, and a 1928 letter from LBJ to his mother also document the historical significance of Welhausen School.